I’d like to introduce you to one of my favorite creatures. 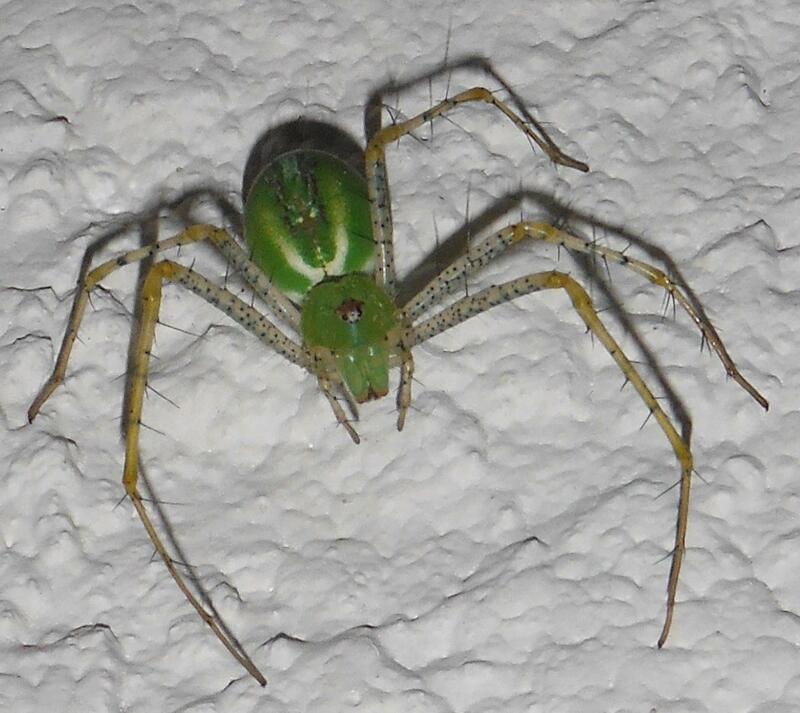 This is the Green Lynx Spider. 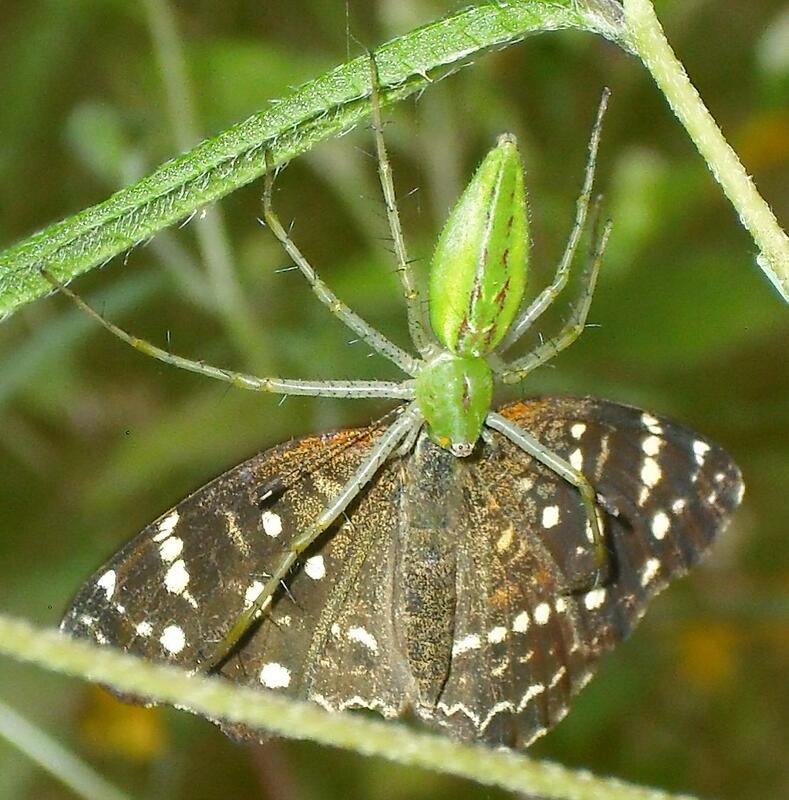 Green Lynx Spider, Peucetia viridans preying on butterfly, Anthanassa sp. Cuernavaca, Mexico. Yes, this particular spider is preying on a butterfly. I know…I love butterflies, too. But the Green Lynx Spider’s taste for Lepidoptera can help control crop pests, such as moths and their larvae which feed on corn, cotton, cabbage, and other plants. I find these spiders beautiful, from their bright green color all the way down to those fantastic spines on their legs! 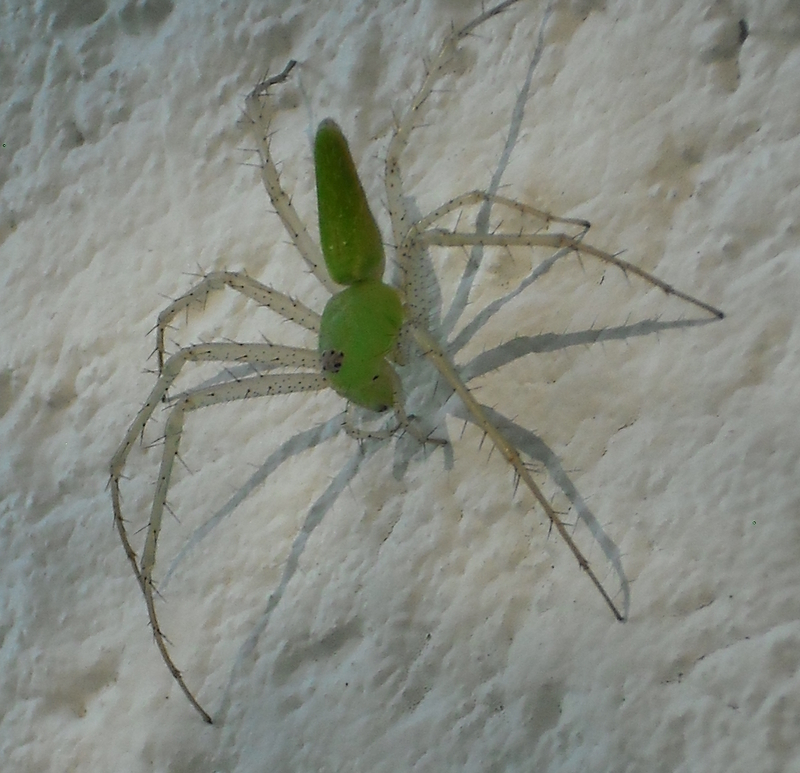 Green Lynx Spider, Peucetia viridans. Cuernavaca, Mexico. 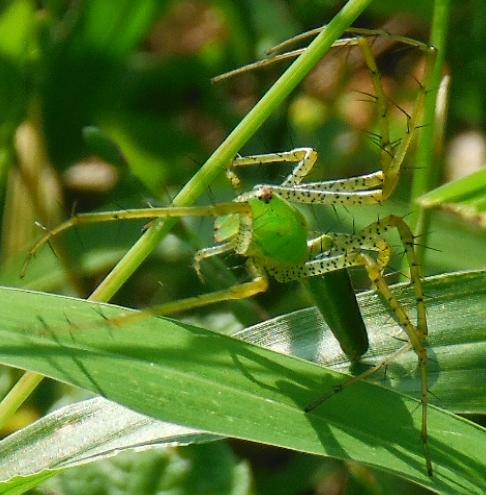 The venom of the Green Lynx Spider is fairly harmless to humans. However, females have been reported to spit venom in self-defense [pdf]. Had I known this at the time, I might not have gotten as close as I did while photographing. Fortunately, none of my subjects decided to demonstrate this capability! Another shot of the same specimen pictured above, which was now aware of my presence! There are only two species of Green Lynx found in North America: Peucetia viridans and Peucetia longipalpis. The two species look very similar, though P. longipalpis is smaller and typically has a more rounded abdomen than P. viridans. The folks at BugGuide also say that white hairs on the abdomen and the absence of a chevron pattern (V-shaped markings) may be characteristic features of P. longipalpis. I suspect that most of the specimens I’ve photographed here in central Mexico are P. viridans, due to their elongated abdomens and chevron pattern. Another Peucetia viridans. Cuernavaca, Mexico. However, I’m not so sure about this one. Is this P. viridans or P. longipalpis? Same specimen as pictured above. Cuernavaca, Mexico. I simply love these spiders! One of the greatest bug-finding moments I’ve had here was walking outside one morning, after months of looking at pictures of the Green Lynx Spider, only to find one perched on my wall. The first Green Lynx Spider I ever photographed. So get outside with eyes wide open and camera in hand. And find out what beautiful spiders are in your backyard!